No, this is nothing like Justice League. Now go away. Warner Brothers and DC comics seem to be upping the ante lately. They announced a new Superman movie. Then they announced it was going to be a Superman Batman movie. Then it morphed into a Superman, Batman & Wonder Woman movie. Now comes the report that they have cast Jason Momoa as J’onn J’onzz, the Martian Manhunter. There are also reports that he might play Doomsday but those are silly. All Doomsday does is grunt and beat up buildings. He would be completely CGI in the movie. A dude in a rubber suit wouldn’t cut it. 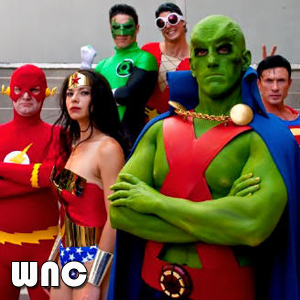 So now we have a Superman, Batman, Wonder Woman, Martian Manhunter with a possible cameo from Doomsday movie. Well, whew, at least that’s nothing like a Justice League movie. Now, not that long ago in a land very near here, like about 3 feet from where I’m at at the moment, I wrote that it was quite possible that Warner was going to screw the pooch so bad with this next “Not” Justice League flick that the fallout could be awe inspiring. Think Lone Ranger meets John Carter of Mars level of bad. The kind of bad that could ring up a billion dollars in losses. The origin stories of the characters are pretty well known. They could pay lip service to them and move on. That would leave them some time to flesh out the characters and get in a good fight scene or two. I have reservations about busting out Doomsday in the first movie but I’ll defer judgement until I know more. Also, from rumors I have heard, none confirmed, they may be planning a 3 movie story arc. That would justify busting out Doomsday as a villain in the first series. A while back Darren Franich from Entertainment Weekly took on the idea of casting a Justice League movie. Back then it seemed silly, now it seems prescient. So let’s let Darren share his wisdom. Remember when Zack Snyder officially announced his intention to put a Batman movie inside a Superman movie? On Wednesday, he got even more ambitious: Warner Bros. officially announced that Gal Gadot was playing Wonder Woman. We’ve all had a day to work through our complicated feelings about that news. But now it’s time to move on to more important things. Snyder’s incipient Superman saga always carried the implicit promise of bigger things: A whole multimovie mega-franchise focusing on different DC superheroes, all leading up to a franchise-knitting superteam film. A tricky prospect, since audiences already rejected every conceivable thing about this character a mere two summers ago. But there’s a simple, clean solution to the Green Lantern problem: Pick a different Green Lantern. Let’s make the Snyderized Green Lantern into John Stewart, the former Marine-turned-galactic policeman. Stewart was the Green Lantern in the swell early ’00s cartoon, which means there are a couple recent generations who consider him the Green Lantern. And no disrespect to Hal Jordan, but John Stewart might actually be a more interesting character. If nothing else, he would fit in better on an ensemble. Where Jordan is a cocky test pilot who crashes for a living, Stewart is a trained soldier. In recent years, he’s been specifically identified as a sniper: A tantalizing prospect, since it implies a Green Lantern who will use his ring in tiny-but-potent and incredibly detailed ways, rather than just making a big giant green fist. Bringing in John Stewart also has the happy effect of making Justice League not just another movie about a bunch of white dudes plus one lady. There are too many good prospective Stewarts to choose from, but there’s a clear choice. Michael Ealy has been doing nonstop great work along the margins of rom-coms and short-lived TV shows for several years now. He was always going to be snapped up for either a buzzy network TV show or a buzzy film franchise. He went for option A, which means he’s currently stranded in the middle of Almost Human, single-handedly raising the show’s game. On Almost Human he’s simultaneously the most likable character and the most deadpan character — an essential ingredient in a Justice League movie already overflowing with big burly personalities. Ealy is 40, old enough to play Stewart as a gruff professional who doesn’t like working with newbie Superman or vigilante Batman; but he looks about 25, young and fit enough to look good in a Green Lantern costume. (Which, by the way, let’s make it a real costume this time, and not an eyesore body-paint cartoon.) Best of all, Ealy has those steely eyes, which will be perfect for the introductory scene when we meet him on sniper detail in a secret sniper mission in Kahndaq. Side Note: Yes, John Stewart has almost the exact same name as the host of the Daily Show. Warner should steer into the skid on this one. Immediately after casting Michael Ealy, they should release a video where Ealy prepares for his role — but due to a comical misunderstanding, he winds up starring in a trailer for a Jon Stewart biopic. Let’s call it Aaron Sorkin’s Jon Stewart: An American Life. Pause to imagine Ealy playing Jon Stewart opposite Ben Affleck as Tucker Carlson. This is how you win the Internet. I’m so sick of the “Aquaman is Lame” meme. It’s a joke that became a certain kind of set-in-stone conventional wisdom that everyone agrees with and nobody ever questions. It’s also an idea that derives entirely from Entourage, which is another way of saying that it’s a stupid idea we should have stopped paying attention to years ago. Detractors inevitably bring up the fact that he can talk to fish as evidence of lameness. DO YOU KNOW HOW MANY FISH THERE ARE ON THIS PLANET? I’m talking, like, a fleet of alien ships has most of the Justice League cornered in Metropolis, and then suddenly from Metropolis Harbor there’s a huge typhoon wave, and every killer whale on the planet rams straight into the alien fleet, destroying them. It’s like Free Willy combined with that scene in every Peter Jackson movie when a huge army attacks another huge army. Aquaman is so powerful, you guys. We’ve already got a couple of strong-silent-handsome-brown-haired guys on this team. 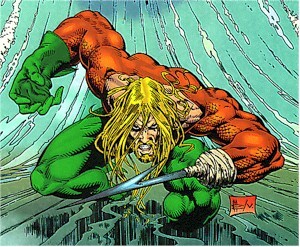 So Aquaman needs to be a bit different. I say play up his aggressive side: Give him the beard, consider the hook, maybe zero in on the idea that he only wants to protect his undersea world and doesn’t initially care about the surface world. Basically, you make him Thor with cooler powers, plus the embedded possibility that he and Wonder Woman could have a surprise stranger-in-a-strange-land warrior chemistry. I say go with Joel Kinnaman, who can simultaneously look like a perfect human and a total weirdo. Like Ealy, Kinnaman has long been the best thing on a bad show. Kinnaman’s RoboCop looks questionable, but RoboCop’s not a real character. With Aquman, Kinnaman can leverage all the aggro-charm he shows on The Killing; the 6’2 actor can also quite literally stand up to Henry Cavill. Best of all, Kinnaman’s Swedish, so it will make total sense in the Aquman spinoff when Alexander Skarsgard plays Ocean Master. No question, this needs to be Matt Smith. There is no one else. The Justice League Fratboy Ubermensch Muscle Beach Association needs a charming nerd character, somebody who is good at making exposition sound like witty banter, someone who can be for Tumblr what the Cavill/Kinnaman/Affleck brigade is for Men’s Health/Esquire/GQ. Flash’s most popular alter ego is Barry Allen, a prototype for nerd-cool: A scientist, a comic book fan, has an out-of-his-league girlfriend frustrated by the fact that Barry is never on time. Matt Smith doesn’t look much like Barry Allen, but we already have a blond guy. And casting Smith means turning Barry into a British guy. This is a scary move that is actually a genius move: It immediately removes the onscreen DC Universe from the necessity of constantly setting up more fake U.S. cities (bye-bye, Central City! ), and it allows the potential Flash movie to film in incentive-happy London. It also gives Warner Bros. their own Hiddleston: An Internet-boyfriend British guy who will happily answer every question at the Comic-Con panel — hell, even the New York Comic-Con panel — while the bigger stars look on in wry amusement. Smith has spent years on Doctor Who making techno-babble sound like prose poetry, a valuable asset to any superteam. And physically, Smith adds a new flavor to the mix. He doesn’t need to be a bulked-up megadude like other members of the team. Come on, just imagine the first scene where he discovers his super-speed powers — the look of terror on Smith’s face turning into wonder as he races through the streets of London, the moment he stops running and finds himself in the middle of the mountains of Tibet and says “Hello!” to a monk, who nods sagely back at him. I know, I know. Listen: This movie needs women. More to the point, it needs a relatable female heroine: Someone to provide a real-world counterpoint to Wonder Woman, a walking icon of feminine power played by a former Miss Israel probably in something resembling a golden bikini. There are more obvious choices to round out the onscreen Justice League. I love Martian Manhunter, but he has too many superpowers for a superteam that’s already ridiculously overpowered. For the first go-round, we need to emphasize how every member of the League has a very unique set of skills; Martian Manhunter has basically every superpower they have, plus shapeshifting, plus telepathy, plus he’s another last survivor of a dead planet. On a less-crazy note, Cyborg would add some teen-bait YA-ready drama to the cast — especially if you can get Michael B. Jordan before everybody else does. And I’m tempted to say the movie should really drill down into the ranks and bring in a comic-relief duo: Booster Gold and Blue Beetle, say. Or, even better, Fire and Ice, who have clearly defined powers that make for cool visuals. But let’s be bold. Brave and bold. Let’s take a character with a goofy name and about fifty different origin stories and turn her into an essential piece of the Justice League puzzle. It’s not the first time that happened: The cartoon Justice League brought in Hawkgirl, at least in part because they just needed another gosh darn lady. (Adding in Hawkgirl means this could be the rare superhero movie that passes the Bechdel test.) And Hawkgirl’s tangled continuity is its own reward. When Snyder and his crew radically change Superman, fanboyswill inevitably whine. But literally any change they make to Hawkgirl will be a net positive. So I say they zero in on a few key elements from Hawk mythology. Lose Hawkman: He’s boring. But let’s take one of the original key elements of his character and shift it over. Let’s make our Hawkgirl into a renegade archaeologist — think Tomb Raider — who discovers a mysterious artifact buried in an ancient pyramid/tomb/ruin. Let’s make one key change straight out of the Sam Raimi playbook: Instead of artificial wings, she sprouts actual wings as a result, which means A) you’ve immediately set up a nice dichotomy between Hawkgirl and the specimens of human perfection on the team and B) you set up lots of easy jokes about how hard it is to dress for wings. In this way, Hawkgirl could also fill the one role we don’t have in Justice League yet: The everyman. So we need someone who can play Everyman but who is also a proven commodity as an action person. And not just any action: Where Wonder Woman can get by on superhuman strength, Hawkgirl needs to be a scrappy fighter. (Consider bringing in Michael Madsen as her old boxing teacher Ted Grant.) And it would be a big bonus if the actress in question is already attached to one franchise in a supporting role, which means that every press tour for that franchise will turn into a stealth Justice League press tour. And it would a double bonus if the actress worked with Zack Snyder before. In that case, the choice is clear: Jena Malone, newly ascendant after her ace supporting turn as killer huntress Johanna Mason in Catching Fire. After a few years in the indie wilderness, Malone has re-emerged: She’s got a part in Paul Thomas Anderson’s Pynchon adaptation Inherent Vice, and is guaranteed at least a couple of standout scenes in the biggest movies of 2014 and 2015. Malone could give Hawkgirl some pathos (when she realizes those wings are stuck to her) but also some no-bull charisma (when she opts out of surgical amputation, deciding that she’d rather keep the wings, look weird, and fly). There are plenty of other tantalizing possibilities — Emilia Clarke is almost right — but Malone is the clear choice. Pause to imagine the scene when Aquaman-Kinnaman dismissively says, “Aren’t you a little small to save the world?” and Hawkgirl-Malone floats three feet into the air and kicks Aquaman in the face. Aqua-Kinnaman: “I like her.” So will we. Well, as you can clearly see, there is no plan to make a Justice League movie of any type. 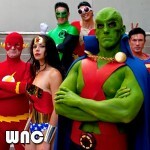 It’s just a little Superman, Batman, Wonder Woman, Martian Manhunter with a possible cameo from Doomsday movie. They’ll probably shoot the whole thing on an i-Phone. Let’s face it, Zack Snyder is the Daniel Hudson Burnham of film. If he’s going to do this, and at this point I see nothing else he could be making, then he’s going to go all in. Which suddenly makes this an interesting project to watch. Eminem – Superman Uncensored from EL FOXO on Vimeo.